Our centre is in the tiny hamlet of Gartsite in the Balkan mountain range, were we are surrounded by stunning views in every direction. Below us is the spa resort of Voneshta Voda, famous throughout Europe for its healing waters. The centre is a fully restored farm house, with a variety of accommodation available. The rooms can be private en-suite or shared. The rooms all have original beamed ceilings and wooden floors. They have wet rooms and are fully equipped for a perfect stay. “My first visit to Martin and Frans Yoga retreat took my breath away! For once I was speechless! The views and early morning walks gave me time to reflect on my year so far and after changing jobs and health concerns it was a well needed break from the hustle and bustle of my daily life!” Sally. The cellar is built around the natural stone, and the ceiling is made of huge wooden beams, and all the timbers were locally sourced. The cellar is a cool space on hot sunny days, and is where we take meals. In the evening, we can show movies from the mounted projector. The cellar has large sofas and is a space you can relax in and unwind. Our garden has decking and a small pool for those hot days. There are relaxing loungers and garden furniture for you to soak up the warm sunshine in between your yoga practise and trips. The grounds also include our orchard with fruit trees and walnut trees. All you will hear in the garden are the sounds of the abundant wild life, or me cutting the grass. It is a blissfully relaxing space, with only a handful of neighbours and no roads. Our yoga studio is in the traditional barn, which we had specially converted. It is a huge light and airy space. The ceilings are high and beamed, and the floor is made of natural timbers. Natural local stone has been used to give a natural feel to a space that is peaceful and calm. Your stay will include all meals at the centre. We are vegan/vegetarian, and we source our larder from the local market and local growers. You will notice the difference in the taste of the food, as it is fresh from the local farm to the table. We can adapt menus to suit all needs. We are in an area of outstanding beauty, and you will have the opportunity to visit local sites. One of these is Kapinovo, where we can swim in the crystal water fresh from high in the mountains. Another is the ancient city of Veliko Tarnovo. Once the capital, it is set around the river Yantra, with the city being overlooked by the Tsvarets Castle. The old city is made of cobbled streets with local artisans selling their goods. There are cafes and bars with lunches from as little as £3 each. Veliko Tarnovo is a cosmopolitan city with visitors arriving from all over the world. We have been running these retreats for 10 years, so you can rest assured you are in experienced hands. Look at our reviews for an unbiased view. Fran and Martin have 40 years plus each of yoga experience. 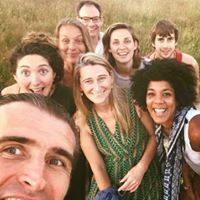 Fran will be your teacher on the retreats, and Martin runs Yoga teacher training courses here as well as in Southend, at Yoga Dharma Southend. From the moment you arrive you will experience Frans warmth and enthusiasm. She will make sure you have everything you need for the perfect yoga holiday.